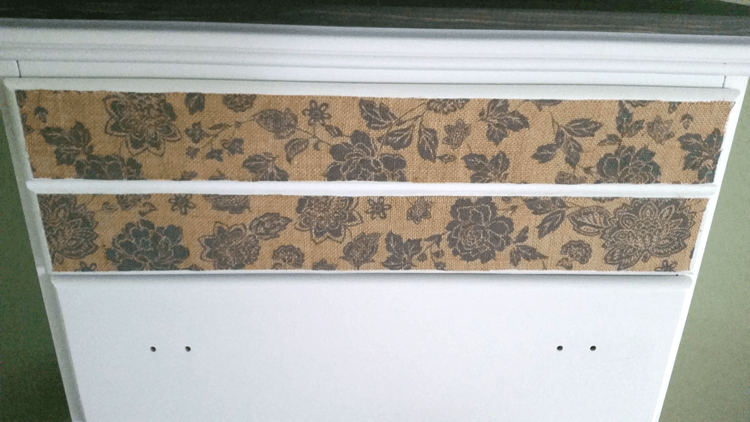 Mod Podge DIY Dresser Update - From Boring to Burlap! 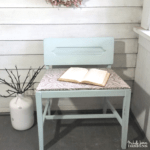 Well it has been a few months since I joined into the Fab Furniture Flippin Contest but I couldn’t resist because Plaid/Mod Podge is the sponsor and the theme is Garden Treasures with Mod Podge. 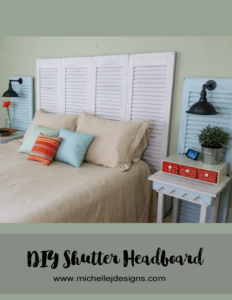 I love Mod Podge and have used it quite often in my projects such as this canvas art I made for our guest room. 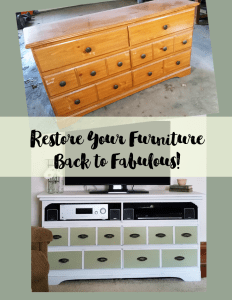 This time I decided to be like Oprah and “Go Big or Go Home” I did a Mod Podge dresser update! 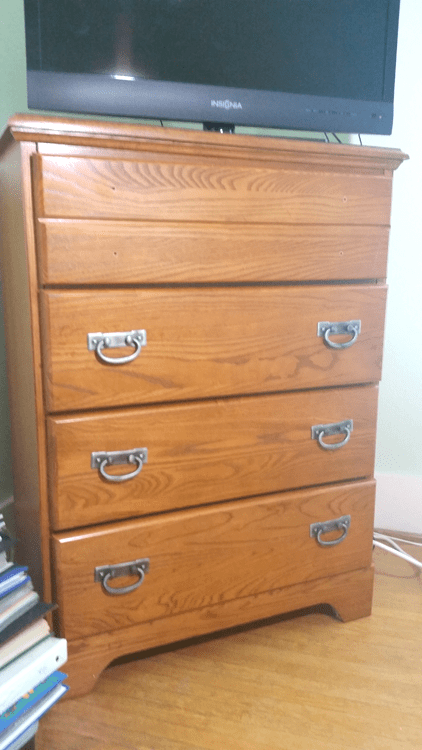 Dresser – This one was my son’s for a lot of his childhood. 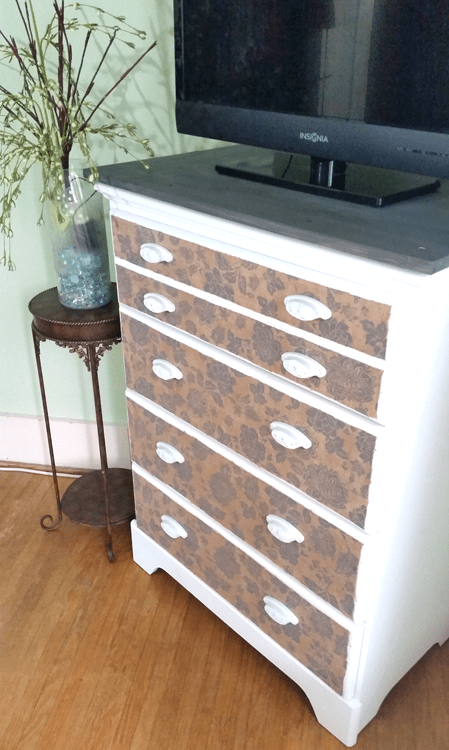 When I started this dresser it wasn’t in terrible shape it was just boring. I knew it could be better. So much better. Oh and the drawers don’t come out. We absolutely could not get them out. 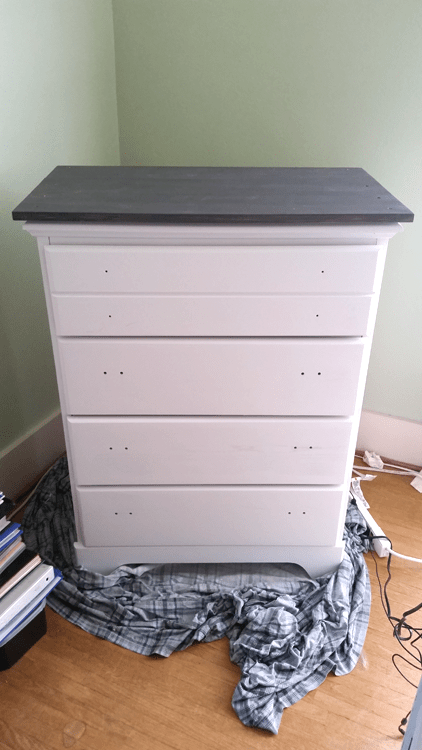 So I worked around it and painted the entire thing with the drawers opened just a tad. 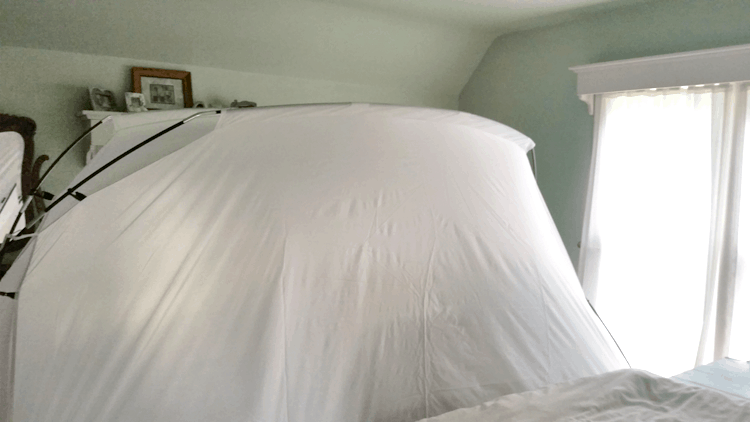 It has been very hot and humid here in the midwest and I did not want to risk painting in the garage or outside and having the paint not dry so I set up the spray shelter in our bedroom and went to town. You should have seen me trying to put the spray shelter together by myself. It was quite comical and if I had been filming myself I am sure I would have a million views on You Tube by now. It took up a large portion of the room! But it worked like a charm. The photo below is after one coat. After three perfect coats my kitty jumped up and walked across the top. I was so frustrated. And she didn’t like it when I had to wipe off her paws. She was pretty mad. Needless to say I had to come up with a way to fix it. I asked Jeff if he could cut some wood and make a new top to go over the top. We purchased two pieces of the nice wood at Menards. They were 12 x 36 and cost us just over $7 each. But it was worth it. He cut two pieces to size so they would over hang on three sides and be flush with the back. 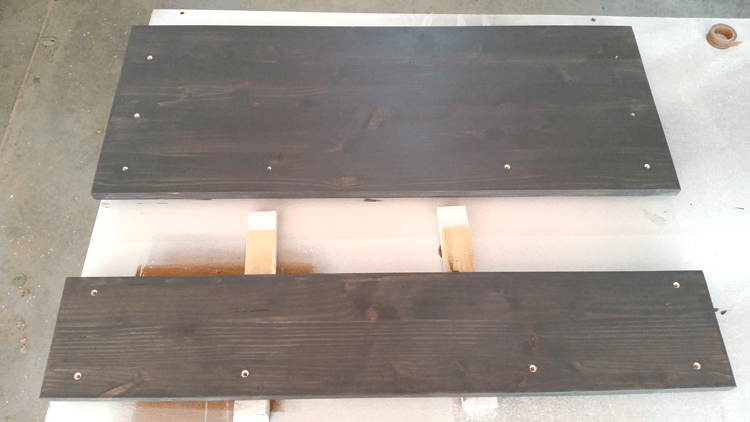 Then I stained the boards a nice gray. And because we couldn’t get the drawers out of the dresser we had to screw the wood on from the top. It’s okay though it gives it a bit of an industrial look. In a funny sort of way. But in the long run, Sasha did me a favor. I like it this way much better! Yay! The best part. 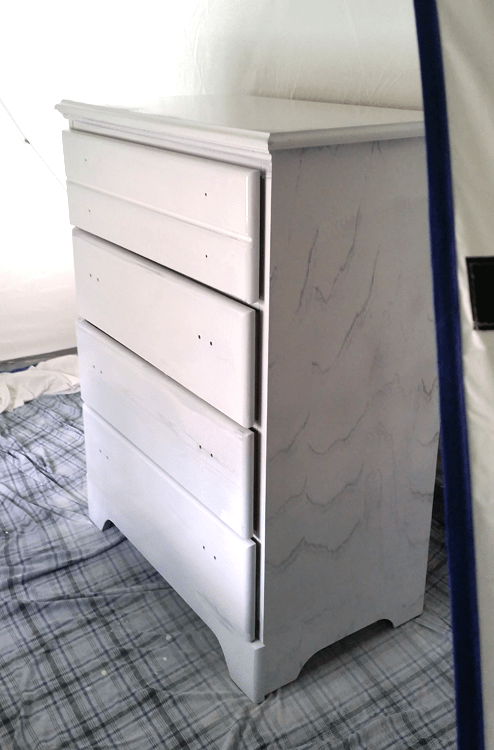 I used burlap fabric and covered the drawer fronts. The sponsor for this month’s Fab Furniture Flippin’ contest is Plaid and Mod Podge. They sent me the product for this post and I was very excited. 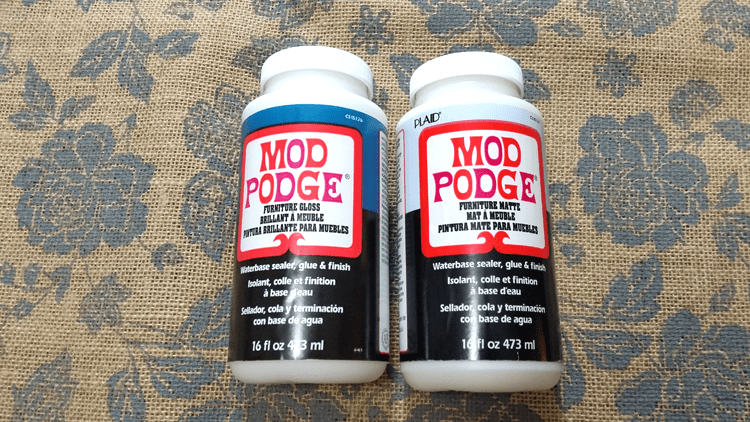 I had never seen the furniture Mod Podge. I really did not even know there were different kinds except for the type of sheen. They sent me a bottle of the matte and the gloss. I chose the matte finish for my dresser drawers. 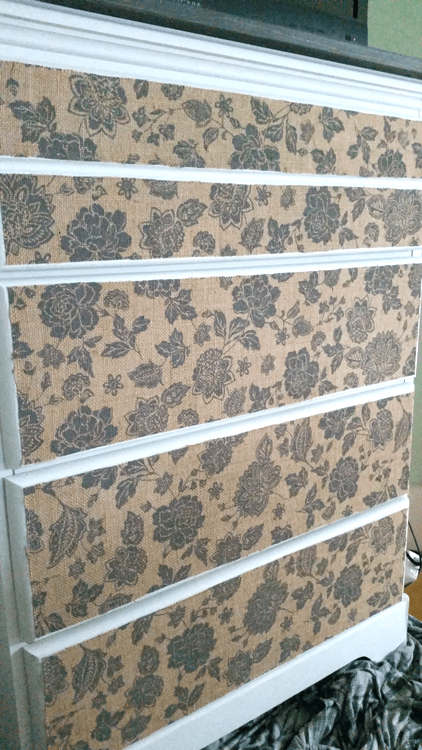 First I cut the pieces of fabric to fit on the drawer fronts. Then I followed the instructions on the bottle. 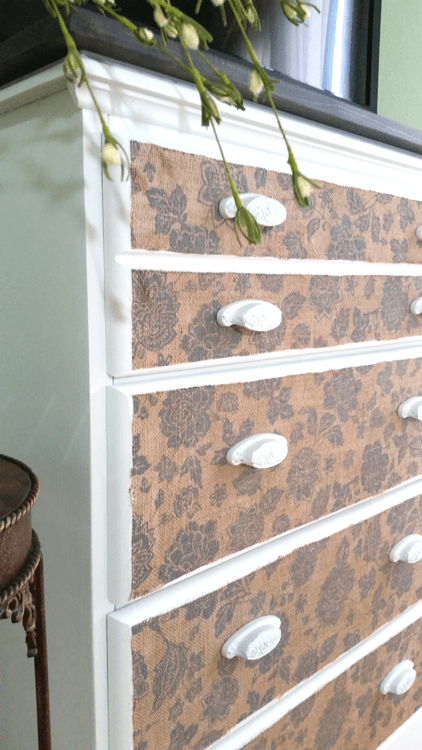 I placed a coat of Mod Podge onto the drawers and carefully added the fabric. Since I did this in the evening…actually just before bed time. 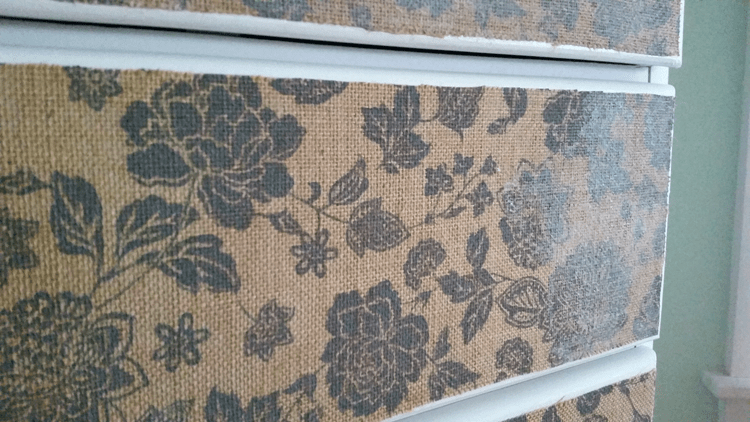 I waited until the next morning to add the Mod Podge over the top of the fabric. See the cloudy part? That is the Mod Podge. It dries clear but this is nice because you can see where you have put it. I only put one coat over the fabric. If you want more coats then be sure to wait an hour between each coat. The last thing to do was to add the new drawer pulls. We are still working on the bag of drawer pulls Jeff got at the thrift store. They have been used on so many projects including our TV Stand, this side table, and my Irish Blessing table. I love these things. This time I painted them white and distressed them a little bit. Don’t they look great? I love they way they turned out. 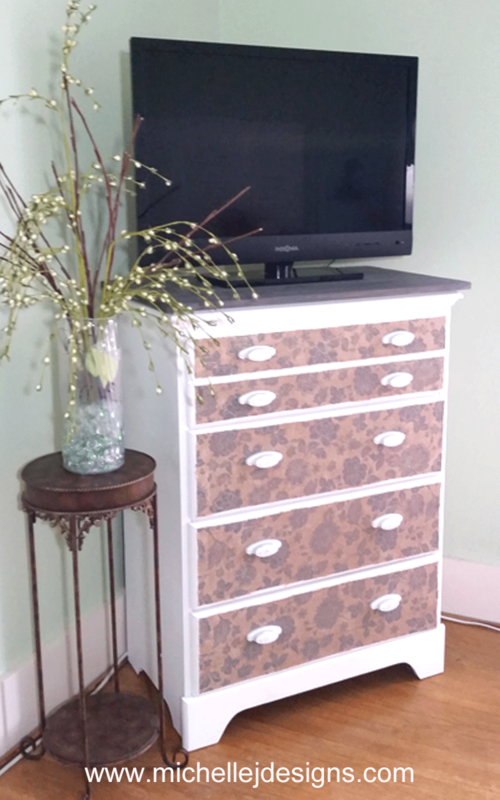 Once they were added the DIY Mod Podge dresser update was done! Yay! I love the way it turned out. What do you think? 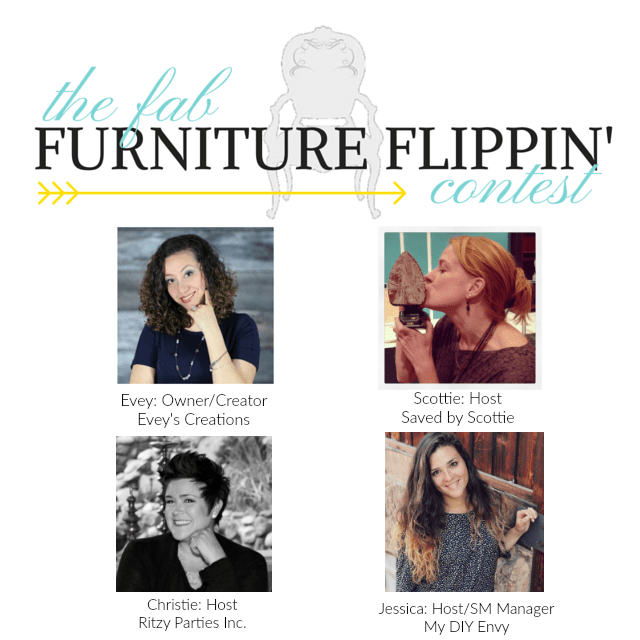 If you love DIY and would like to be part of the Fab Furniture Flippin’ Contest you can email info@fabfurnitureflippincontest.com. 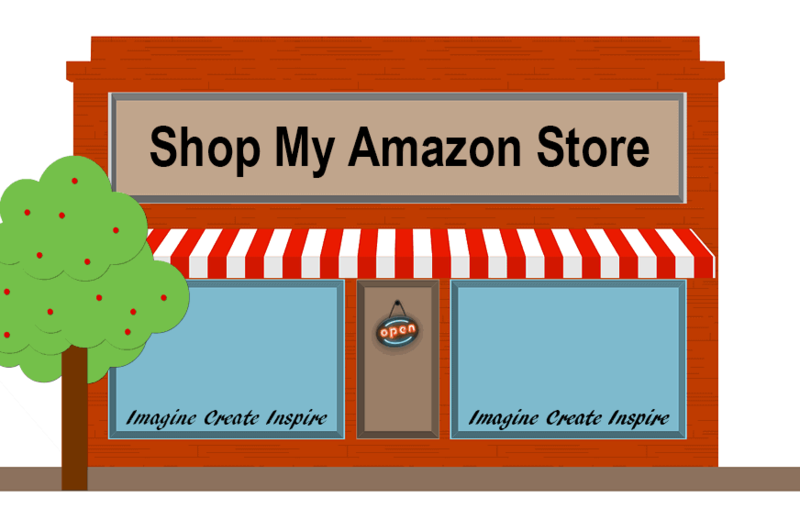 You can see all of the projects at The Fab Furniture Flippin’ website! The gray top and white pulls did it for me, Michelle! They pulled the colors of the fabric together with the dresser. Beautiful! Thanks so much Nancy! That means a lot to me coming from you. You have great taste! This is a beautiful transformation, Michelle. I love the pulls. What a great job you did. The tent was pretty impressive too! 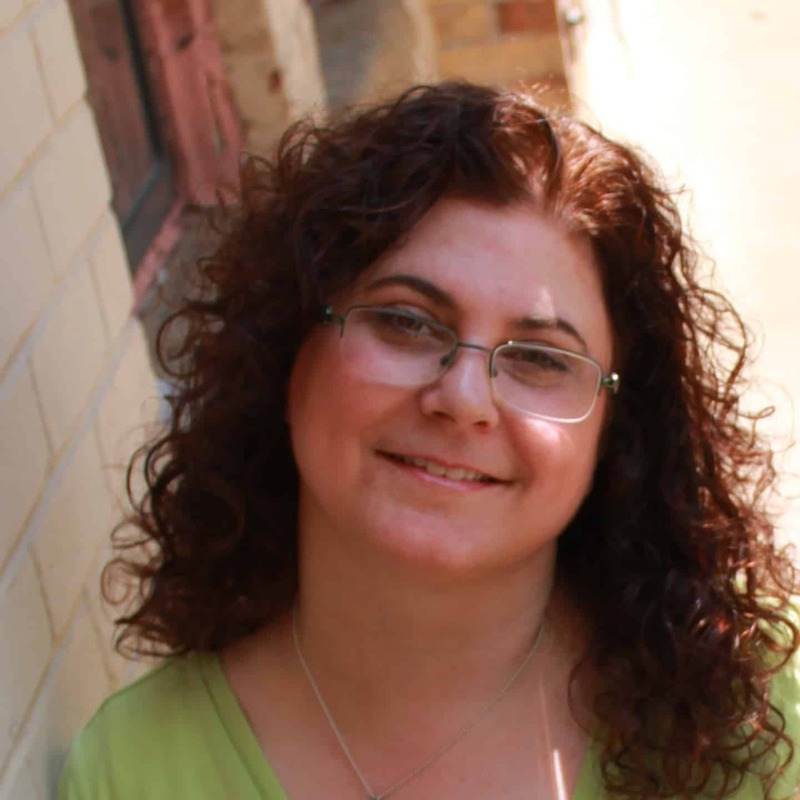 Thank you Carolann! I love the way it turned out and it didn’t take too long once I got the top fixed up. LOL! This came out so nice! You have some frisky kitties! haha, I would have been mad too, but it made me chuckle. 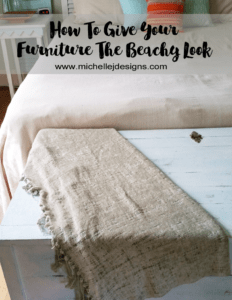 Love the burlap on the front of the drawers and the darker wood top. can’t wait to try that on something soon. Hi Heather. Yes, this kitty in particular is a frisky one. The little sh**! LOL But I do love the new top so that says something for her. Thanks for stopping by. Definitely an improvement! I love the white with the floral burlap and the hardware is perfect! Thank you Jeannee. I love the dresser now. I hated the brown and the hardware before but the burlap and the new drawer pulls really pull it together. 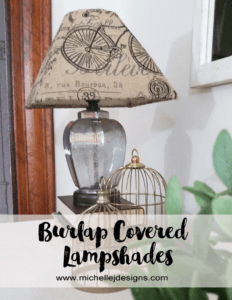 I love the burlap adds great texture, and at times kitty kniws best! lol love the top too! Hi Brenda. Sasha did know best…this time. LOL! She probably thought she was doing me a favor. 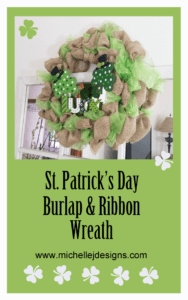 The burlap is great but the only thing I don’t like is the roughness of it. If I am lazy and close the drawer with my leg it can be quite scratchy. 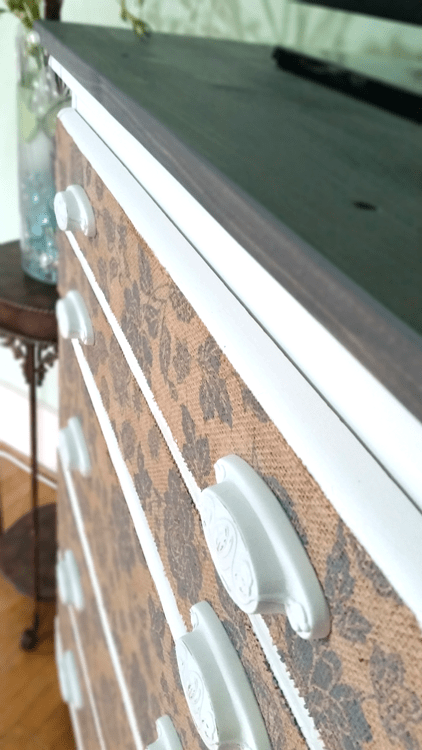 What a pretty pattern and update to the dresser <3 I Love the new top and those pulls are fabulous! Heat job, pining it ???? Thanks Toni! And Thanks for pinning. I really appreciate it! What a great update, and such a naughty kitty! I know right? Sasha has always been a little naughty. Thanks. I love the dresser now. This plain dresser now looks amazing. I love the design on the burlap. Thank you Debra! I do like it a lot better now! 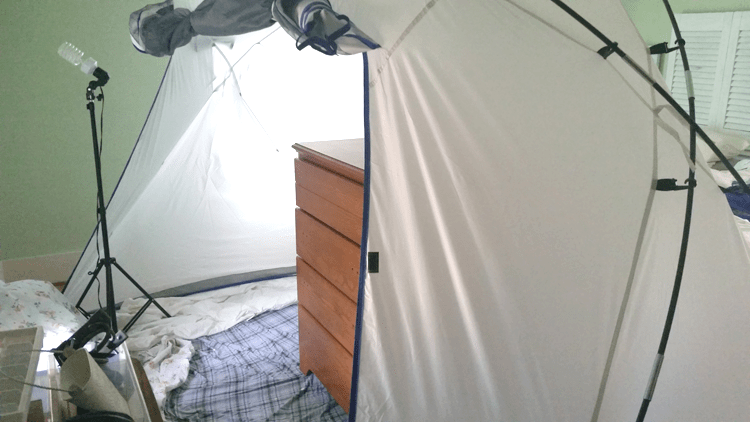 The tent up in her bedroom is epic! 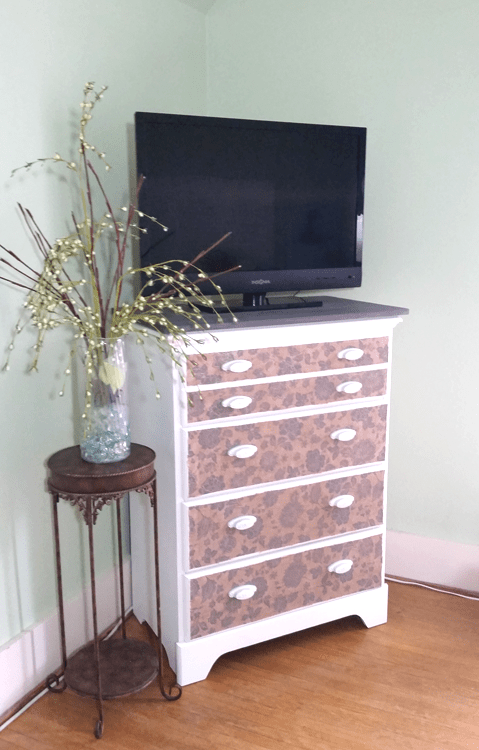 I love this one with the fabric on the drawers and you are so right that the top being gray looks better. I hope you are keeping this beauty. Hi Sue! It was a fun time in the big tent! LOL! I love the gray top too. We are keeping this one as it holds Jeff’s clothes and our all important TV! Thanks for stopping by. I love the combo of the hardware and the burlap. So pretty! Hi Lora. Thank you. I think it looks pretty nice and I love to see it when I walk in the room!